Two weeks of Bones have passed now with nary a word about Brennan being shot. No mention, still, of Hodgins' lost fortune, and he seems as chipper as ever. Yes, Bones season 8 is the season of the standalone, asynchronous episodes, it seems. 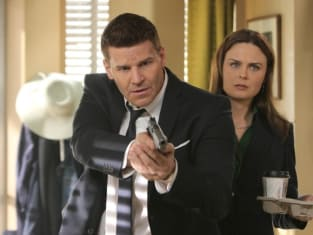 I know that previous seasons of Bones have consisted of season-long story arcs that aren't mentioned week to week, like the Gravedigger, interspersed into the case-of-the-week episodes - but there's something about this season in particular that continues to make the entire season feel disconnected from itself somehow. It's disconcerting. Despite the disconnect, as far as independent episodes go "The Fact in the Fiction" was at least fun. Maybe the most fun episode to date. Dr. Oliver Wells made quite the introduction as the latest intern at the Jeffersonian. When the corpse-of-the-week's body was missing its head, he tracked it six miles away and retrieved it from a pack of coyotes; then brought it directly to Brennan at the diner, spilling the head from his shoulder bag and into the floor while Booth held him at gunpoint thinking him to be a deranged lunatic. Dr. Wells emphasized the team and how well they work together by being the odd man out. Hodgins was excited to have someone as wacky as himself to work with in the lab and watching the two of them together was fun. Hodgins works well with all of the other interns, but he's not as convivial with them as he was with Wells. Tonight he seemed downright giddy and welcomed Wells to the team (without Wells hearing) by saying it was great to have a physicist in the lab. Which sort of begs the question why they didn't already have a physicist in the lab since, yes, it makes sense to have one on such a well-rounded team of brilliant minds. Angela bristled at Wells' introduction to the lab because of his cocky demeanor. She was quick to put him in his place regarding the way things work around the lab. He seemed to take her words to heart, at least momentarily. But that's part of what makes him interesting. He, like Brennan, is unapologetically intelligent. He's brainy. And ballsy, standing up to Brennan and challenging her beliefs about basically everything she knows and holds to be true. We're used to seeing Brennan be the most intellectual character on the show, so it's always nice to see her grapple with the idea that perhaps she's not the smartest person she knows. One of the things that she has the hardest time accepting is that she cannot possibly know all there is to know about absolutely everything. It's nice to see her receive and accept the challenge of a new character who seems strong in his own right. I wish I could write this review solely in the faces Brennan made during some of her interactions with Wells, or quote their faces. Because their faces tonight were some of the best parts. Wells let Brennan call herself narrow-minded. With that impossibly-possible speech, he confused her. While this wasn't quite the "Brennan questions whether time travel may be possible" episode the promos led us to believe, Brennan did question herself and her intelligence, finally besting Wells at the end as a way to prove her superiority and place at the top of the Jeffersonian pyramid and welcome him to the team in her own way. Speaking of the time-travel aspect of "The Fact in the Fiction," since that was an important part of the episode, everyone's moments to which they would return, or not travel, were great testaments to the characters. Hodgins would travel back to the exact moment he met Angela. Angela lied at first saying she too would return to that moment only to later confess to Cam that she would actually revisit her time with Birimbau. A time to which Cam would also return. The moment between Sweets and Booth was nice. Sweets wanted to be able to tell his adoptive parents that he's thankful for them. Booth assured him that they know. Booth, knowing that it might mean he would never exist, would stop the assassination of President Lincoln. And Brennan, being the smartest, would go nowhere at all, content to live in the present moment knowing that all she wants is right in front of her. What did you think of "The Fact in the Fiction?" Do you like Dr. Wells? If you could time travel, to when would you go?